With so many weapon slings on the market, it might seem hard to believe that there’s any room for improvement. And yet, after five years of testing, design, and re-design, the D-Rmor Gear AE-SIR (Aramid Enhanced, Sling Integrated Retention) was born. The AE-SIR-XL (ExtraLight) starts with a 1.5″ wide shoulder pad, which is made from incredibly light and strong Trelleborg AB HANK (High Abrasion Resistant Kevlar) fabric. This material boasts extreme abrasion, UV, heat, and tear resistance, while being just the right combination of grippy-yet-smooth. It conforms to your shoulder while weighing virtually nothing, and wont chafe or bite like many other slings. The AE-SIR-P (Padded) is the Cadillac of the AE-SIR line. It incorporates a wider 1.75″ pad, adding a rugged cushion for heavier weapons. The pad is color-matched to the rest of the sling, and adds minimally to the overall weight while helping take the load off. Not satisfied with normal levels of ruggedness and durability, we decided to incorporate the same Gold Standard stitching used in our FragTuf(TM) gear line, which means all critical seams are dual-stitched with both mil-spec Nylon and mil-spec Kevlar threads, to ensure the sling stays together. No matter what. (Note: due to the UV-sensitivity of Kevlar, any exposed Kevlar stitching will appear black, regardless of the color of the article. This is due to the UV-resistant treatment we specify for our thread. Don’t blame us, blame chemistry). Of course the rest of the sling is built with the finest components available. GhillieTex signature-reduction hardware is used wherever possible, along with 1″ solution-dyed, MIL-A-A-55301 Type III Nylon or Murdock Jacquard webbing, nIR and Berry compliant. 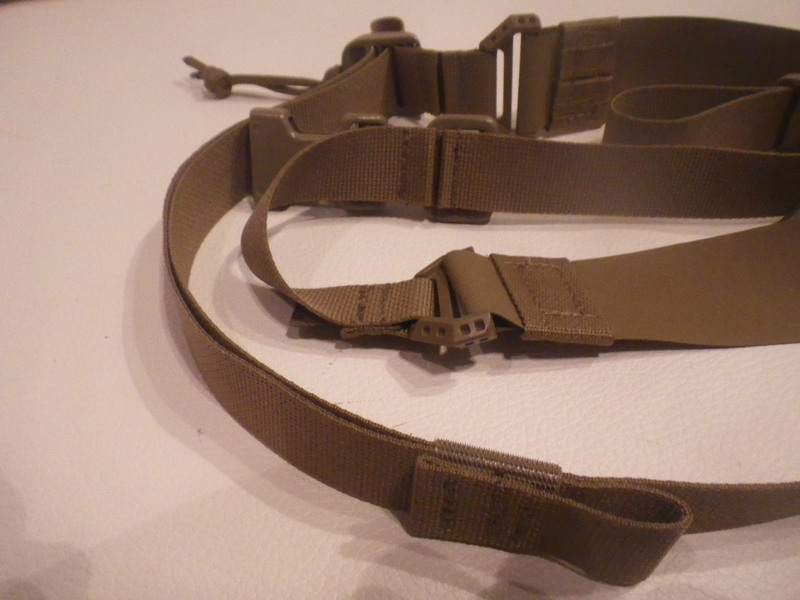 1″ webbing was specifically selected to facilitate use with ANY sling mounting hardware, whether they are 1″ or 1.25″. Finally, the AE-SIR has built-in versatility, with the ability to convert from two-point to one-point configuration in a split second, without any additional (read: expensive) hardware. For those using QD sling swivels, there is an emergency quick-release side-release buckle on the forend. Unclip, and clip into the matching female buckle on the aft-end. Or, for users of HK-style snap-hooks, there is a waiting mil-spec ITW Nexus Ghillietex D-ring right alongside. Whatever attachment method you use, you are good to go. With over 24″ of adjustment built in (13″ of rapid, single-handed adjustibility), and a min/max of 45″ to 69″, the D-Rmor Gear AE-SIR enhanced weapon sling is right at home on most long-guns. And, because it’s us, we are offering an unconditional, fully-transferrable, no-bs lifetime guarantee on the AE-SIR. If you somehow manage to break it, just get it back to us (and tell us how you broke it! ), and we will repair or replace at our discretion. Pricing is $44, and $51 (for the XL and Padded versions respectively) per sling.